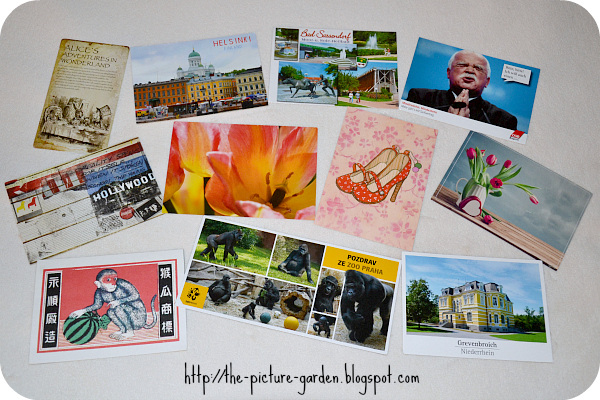 After last month's postcard-palooza things I'm happy to say that the cards keep on coming. Add three cards which I won/swapped in a Postcrossing group on Facebook and we're once again looking at quite a considerable haul. Of course it doesn't matter how many (or few) postcards arrive, it always puts a smile on my face when a new one arrives, not to mention the thrill of possibly maybe holding one from a super exotic location in my hands each time I spot a postcard in my mailbox. 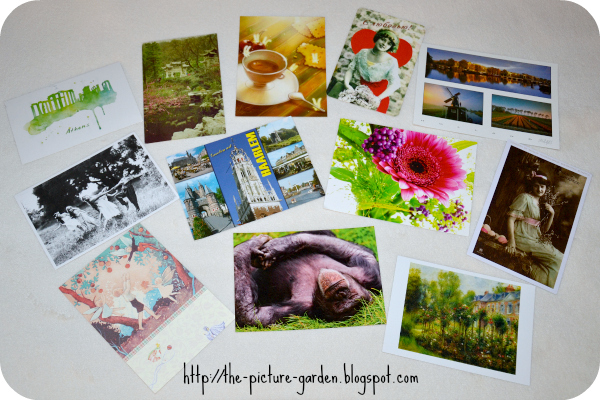 This time my haul certainly put a spotlight on Germany from where most postcards arrived, but I also received cards from Belarus, China, Finland, Lithuania, the Netherlands, Russia, Singapore, South Korea, Taiwan and the Ukraine. Imagine how excited I was when I realized I had received mail from Singapore and South Korea only to turn the cards around and see that the sender chose to send a design depicting ... Athens and Hollywood. *face palm* At least I now own some rare stamps from these countries, but believe me that was a big bummer. On the bright side - I am totally in love with the Alice in Wonderland and the Pretty Shoes card! Apropos far away destinations - according to my statistics, and since I have taken up Postcrossing again last year, I sent cards to 27 different countries and received cards from 21 different ones (in both cases Germany is at the top of the list, closely followed by Russia). Not bad I'd say, however with members hailing from more than 200 countries, I'm looking forward to encountering many more countries in the months to come. Last but not least - did you know that February is International Correspondence Writing Month*? Personally I don't think I have the time (or enough stationary) to engage in a whole month of writing letters, but it's a pretty nifty idea. Are you more a card-type of writer or do you prefer composing long letters? Let me know! I certainly do :-) and I count myself lucky to be on your "letter list"!